If you're on a cruise, and you like to fish for monster bass, this is the shore excursion for you! We'll pick you up from your cruise pier as you get off the ship, and head for Lake El Salto, the best bass fishing lake in Mexico, and one of the best in the world. Known for it's "Hawgs", with catches routinely topping 10 pounds, as well as amazing numbers, averaging between 30 and 80 fish per day(! ), El Salto is a bass fisherman's dream. Your expert guide will lead you, using his local knowledge and skills to provide you with what will probably be the best trip of your life. After the fishing day is over, we'll return you to your cruise ship at whatever time you are supposed to be there. We'll totally customize the schedule to fit your cruise stop! Cruise Passengers: Yes! This tour is available to you for a cruise shore excursion. We will adjust the start time to work for you. Runs: Daily. Pickup and dropoff depend on your cruise schedule. Duration: Varies, depending on your cruise schedule. Lake El Salto is approximately 1 hour from Mazatlan. The remainder of your shore time will be fishing time. Departs: Free pickup from the cruise pier. Not Included: Gear & Tackle (available for rent for $85.00 per person, payable in cash on the day of the trip), Tips. Equipment is "Bass Pro Shop". Don't Forget: Camera, Hat, Biodegradable Sunblock, Polarized Sunglasses, Gear & Tackle (if not renting), and extra money for rental gear, lures, and tips. 2 People Maximum Per Boat. More than 2 people will need to book an additional boat. If you have more than 2 people, you'll need additional boats. Just click "Add More Tours" in the shopping cart to return to this page and add another boat to your cart. Recommended lures vary depending on the season and water temperature. We'll send you the current list of recommended lures with your reservation. Get ready for the bass fishing of your life! 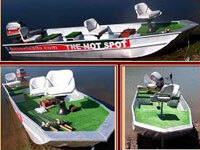 Boats are 17.4 foot aluminum bass boats, with two comfortable seats, plus an elevated casting deck in front. Each boat is equipped with a 60 horsepower engine and the latest Trolling motor.